The morning session started with Esther introducing the opening of the official opening of the COP8, saying that we do not wish to conflict with the Taba meeting. Sean invited everybody to participate in the larger meeting. Esther then detailed the plans for the day in order to make a more informed decision. This will be the day for concrete sharing, and celebrating their success. The format is going to be two people sharing for 20 minutes, with group discussions to follow both in the morning and the afternoon session. The morning session will be representatives from South Africa and Fiji, while the afternoon session will be dedicated to presentations from initiatives from Brazil. After some discussion, it was decided that the Community Taba is going to join the main events, and participate in the opening ceremony. 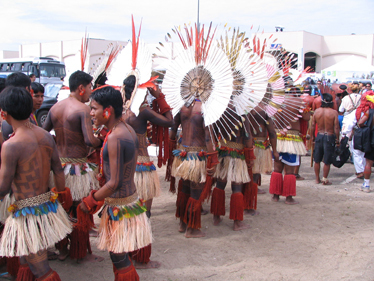 traditional knowledge is used to identify the various reefs, and blessed in a traditional ceremony. The area has become a ´´no-go`` zone. Government pledged to commit 20-30% of the reef as a MPA (marine protected area) at the Mauritius meeting on Barbados Plan of Action +10 in January 2005. Esther pointed out the very unique system that is implemented in Fiji, where the traditional chiefs work very closely with the political system, which is very different from other governments. Suinia Delailagi, from the Fiji delegation, took the stage to emphasize the point that working closely with traditional system has been a very effective method of protecting the environment. He explained his dual role of being a government representative as well as a community representative.A question was brought up about the “no-go” zone and the traditional way of protecting the environment prior to this agreement. 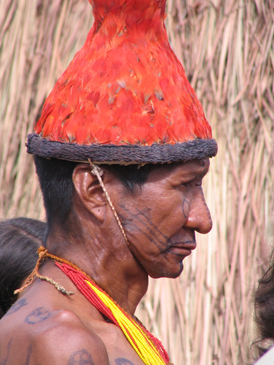 Ratu explained the tribal system with the five sections of the fishing, warrior, building, agriculture and the advisors. The next presentation was from Livingstone from South Africa. He introduced himself saying that he comes from a community of Makuleke people, from the royal family line. Most of the protected areas in South Africa were initiated with a lot of hardship to the local indigenous people. His own people were evicted from their own land in 1969. The Black population had no say in this forceful removal since this was during the Apartheid period. The people the most affected by the removal were the women and children, since they were left with the brunt of building new huts and livelihood in barren lands. After the Apartheid system ended, the Makuleke people regained their land after numerous fights. They wanted to engage the land for conservation purposes. However, in South Africa, the Black population did not have any experience in conservation. Therefore, they actively sought partnerships with private sectors and non-governmental organizations to buy lodges engaged in eco-tourism to provide livelihoods for the community. The area is now managed by the community, and members who have been educated in conservation. 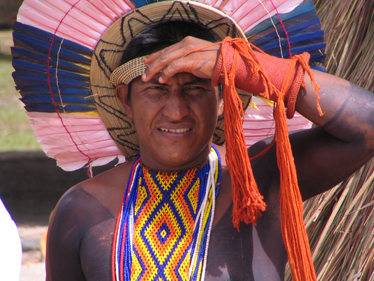 The Makuleke people have now realized that conservation is a good source of income. Livingstone emphasized the importance of land claims after the forceful removal. They further did not wish to be dependent on others, but wanted to be in control of their own destiny. They however sought assistance from various sources. Some of the challenges that they have faced include lack of resources, lack of organization, and so forth. There has been a lot of training in the community working on the various aspects of conservation. They built their own capacity, and are able to share the benefits from the lodges equitably. They plan to keep working on these projects for the general benefit of the community. Questions were brought up on how the Makuleke population have survived during the time they were evicted from their land, and regarding the land claim process. Livingstone answered by stating that after the eviction, they were taken about 400 km away, and their land turned into a protected area. They still practiced agriculture and had a system of sustaining their livelihood. As far as the land claim process was concerned, they had to endure with a long process of verifying that they have claim to the land, and pleading their case to different courts. People tried to discourage them along the way, but they were ultimately successful. After Livingstone’s presentation, the Taba took an hour long lunch break. The afternoon sessions began with the presentation of the four different breakout groups that convened before the lunch break. It started with the presentation of group #2 by Kevin Cox. He presented the work of his group by saying that Andres and Jorge of Universidad de San Paranal (Oceanography students) both remarked that the problem of parks being set aside without consideration of local peoples is a problem in Brazil. A representative from the Proyecto Incluir organization explained her work in the N. Amazon toiling to give local communities a sense of recovery on their land and in their lives. Kabir, a lawyer for indigenous groups in S. Africa gave more detail into the pre-apartheid South Africa history; the Black population was segregated while the recreational national parks were created for the white population. Leonardo from Curitiba discussed the indigenous history of Brazil- 600 years since “discovery” by the Portuguese colonials. 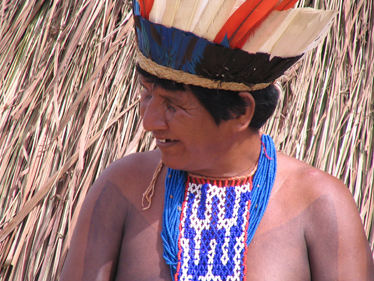 Approximately 20,000 indigenous peoples still live in Brazil with little to no outside contact. Waldir Souza Da Trinidade of Brazil who works with Colonia de Pescadores discussed how mangroves were included as a part of the marine area and indigenous people were not allowed to fish as they became “illegal” occupants of adjacent areas. Also a major concern is a large hydroelectric dam that was built in the area. He claimed that the dam has resulted in decreased fish species. Clarindo Lucas of Guyana discussed how Guyana became independent in 1966 after British Colonial rule. He discussed the concept of “land” and how it was not part of the indigenous peoples’ consciousness as a term of ownership. Moreover, Conservation International was a key facilitator in a major reserve to be created in Guyana but there was and still is much concern by the local people that they will be excluded and no hunting will be allowed, thus destroying their livelihood. Currently, the villages in the park have become the primary stakeholders and CI was attempting to involve all of them but it was proving to be difficult. Group #3 then took the floor, and Willie from Micronesia detailed their discussion. This particular group discussed on issues relating to the communities´ interaction with the rest of society. They emphasized the need to follow-up on commitment made to and by the communities. It was considered disrespectful otherwise. Livingstone from South Africa emphasized the fact that communities have to be the initiators of partnership with NGOs (utilizing their resources) and remain the decision-makers in their own land. Virginia from the EcoForest network in Brazil explained her work in bringing IT technology to the communities as opposed to having the community leaders come to larger international meetings. It has been her experience that dissemination of knowledge is not always obvious in the latter manner. The group consisted of about 10 members, with nationalities from South Africa, Fiji, New Caledonia, and Brazil. A presentation by Hewan Girma for group #4 followed. Group #4 had participants from eight to ten nationalities, where Brazil, Fiji, Ecuador, Uruguay and the Philippines were represented. The Brazilian representatives shared their experiences regarding communities that were expelled from their land when a new government law took effect, prohibiting any population to live in national parks. 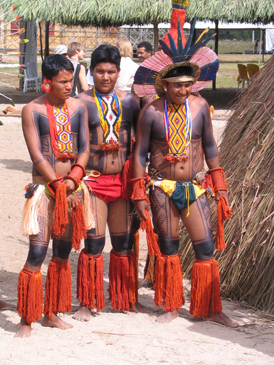 The indigenous people living preserving the land in the coast of the Brazilian state of Parána were expelled. There was no consultation of the community before this happened, and they had no recourse to indigenous laws. A participant from Fiji strengthened this topic of land ownership by sharing his own experience with the people of his village. He mentioned that about 25 years ago, some elders in his community signed a contract handing over their rights to the land to a logging company. However, this happened because they did not understand the content of the contract. They eventually won a legal battle and managed to reverse the terms of this agreement. The community now protects the local environment, especially the forest since they derive their livelihood from it (fresh water fishing and hunting). A recommendation came out of these two experiences where the community needs education in terms of legal contracts and their rights to land. Francisco from Brazil also shared his experiences regarding his work with the Afro-Brazilian group known as the Mangeria people. They have found alternatives to working in the land and protecting it as well. They are engaged in the cultivation of local oysters, sowing, and eco-tourism. They have endured and are still enduring a ten year fight to prevent large enterprises from entering the land and destroying it. Their biggest challenge has been to organize their own community and marketing their product at a larger level. Vitaliano de Ecuador shared regarding his work with the Campesinos comprising of 1000 participants. They produce and export organic cacao and chocolate and export to the European Union, mainly France. This has been a very good experience for the community since they have been able to invest in the social infrastructure by building school and supporting the women’s movement. One of the biggest problems they have encountered to date is the lack of national policy on bio-diversity and protection of the environment. For instance, there has been a dam built not too far from their land that is creating a lot of health problems for the community. The small country planters suffer the most, but since it means big money for the government, the national government is not doing anything about it. To address this issue, they were organizing themselves with student organizations, NGOs, and other interested parties. A gentleman, who doubles as a translator and a community participant, shared his experience in Uruguay where he claims the population is fighting for their livelihoods. Since some of the local and indigenous populations are not part of the capitalist system, any effort that try to mainstream these population is leading to the destruction of whole communities. There is therefore an ideological and political fight for their right to life, and way of life. 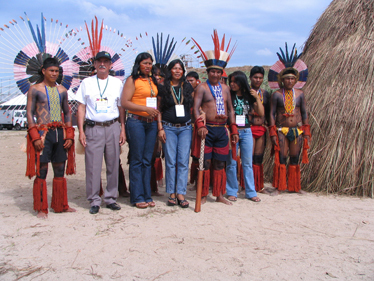 Another group which shared was two ladies from the indigenous representation of Brazil. They emphasized some of the same fight with the government to have their rights recognized. Lastly, a gentleman from the south Philippines shared his experience from the Tala-Unding where their ancestral land which contains a mountainous area was declared a protected area without either their consultation or consent. They proposed to at least join the management system where they would be able to ensure the respect of their ancestral laws. However, this was declined as they were asking to be standing on equal footing. The government then engaged in a series of harassment and intimidation where legal charges were brought up against the elders of the community and some of their member imprisoned. They are fighting these trumped-up legal charges and lobbying at the local, national and international level to regain their ancestral lands. the environment. Annetta from South Africa discussed her similar experience from Livingstone’s presentation regarding policies instituted during the apartheid regime. Her community had also lost their land and reclaimed it in 1994 when the regime fell. The problem they have encountered was in terms of racial integration with the existing settlers. Thus, her community is working on racial integration and forming social cohesion. In addition to the group presentation, a gentleman from Brazil explained the situation with the fishing industry which practices predatory fishing. The government does not allow any of these, therefore it has put together concrete blocks and artificial reefs. This interrupts the local fishing industry and they are not able to compete with the industrial fishing corporation. The afternoon session continued with a full group presentation by William from Pohnpei Island of the Federated State of Micronesia. He represents the Conservation program, started in 1998, which addresses many issue relating to marine protected areas. They have about 15-20% of protected areas, and their goal is to reach the 30% mark. They have educational awareness program, teaching the community about conservation. The group is mostly comprised of young people, the oldest being 36yr old. They have aligned themselves with the government, choosing to educate instead of oppose. They also try to move at a slower pace in order to have the participation of both the government and the community. They have also a Micronesia Conservation Trust, which receives funding from GEF- Small Grants Program ($600,000.00 a year), Private Foundations and so forth. They have discovered that communities do not receive the needed funds for their programs because they lack the ability to write funding proposal. The program further has complementing initiatives working with the PEW fellowship with a University of Miami. A question was brought up on how the initiative began, and the involvement of the communities. The reason the initiative began was because local communities were engaged in conservation, but they do not have the reach of national and even regional NGOs. The role of the NGO is to scale up the effort of the local chiefs, and appropriate the needed funds for the projects. The combination of traditional method with the newer methods has been very beneficial to the community. After the presentation, a video from the last community dialogue event, Community Commons at Fordham University, was introduced. The fifteen-minute video was recorded by Eric O’Connor from Dropping Knowledge. After the video, the Taba broke out into smaller groups to discuss the previous topics and came back again to present to the larger group. Group#2 presented their discussion to the larger group. They had representants from Fiji, Ecuador, New Caledonia and New York. They discussed some of the lessons that they will take back to their own communities. Environmental education was stressed as being an important part of conservation. The next group to present (group #1) was comprised of Portuguese speakers alone. Some of the issues that came out were in regards to the leadership of the governmental bodies. It has been noted that the government does not always do what the community wants, and lack the flexibility to assist community work. There should be a bigger support so there could be a better implementation considering the demands of the community. Another of the biggest issue that came out from the discussion was the need to first meet basic needs such as food before discussing bio-diversity and conservation. Moreover, bureaucracy needs to be broken down and government leaders need to be accessible to the communities. Group #3 then presented their discussion. One of the group members, Francisco, mentioned their problem with selling their goods on the larger market, because of the “middle man” problem; the producers do not receive the entirety of their revenue because the intermediary business men take a large portion for themselves. Manipulation of the community is something that is practiced by the private businesses and even governmental and universities. The last group to present, by Willie from Micronesia, focused on recommendations. The communities must be coming up with their own plans instead of waiting for it to be imposed by NGOs or governments. The government must respect the people and involve them in the decision-making process, and need to be involved in planning. There also need bridges built between communities with similar experiences, as they are diverse communities, facing similar challenges. The true value of the land and community knowledge is not understood and appreciated, therefore there needs to be some type of value and compensation accorded to this type of knowledge. More has to be done at the community level. Avoid NGO rivalries, and methodologies that are confusing and too complex for communities. Increase/improve the educational level of communities in order to enable them to make good and informed decisions. Clearly delineate role of each partner/stakeholder and avoid duplication. The afternoon session ended with the plan for the next couple of weeks.